One of the most unforgetable films at Film Invasion Los Angeles in 2018 was Girl Eating Banana: Audition. 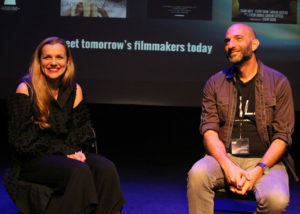 One part art film, one part comedy, one part drama, and completely original, filmmaker Natasha Babenko wowed the crowd with both her film and her amazing energy during her Q&A. I knew even before meeting her that I would want the filmmaker responsible for Girl Eating Banana: Audition to do this podcast. So much so that we went ahead and recorded one even though she is not yet ready to release the film online. So you don’t get to see it, you just get to hear about it. When Natasha releases her film online, I will be sure to ask her to allow me to put it here. In the meantime, please enjoy this interview!